Though we hope this would never come true for you, there will be a time when you wish you had a proper first-aid kit close by. Here’s why. If your injury involves blood-loss, you only have precious seconds to get the necessary supplies to stem the bleeding. Keeping a first-aid kit can provide you with the valuable extra time you need before you can get help. Also, mishaps among kids getting hurt with cuts, bruises and burns is a common occurrence. Hence, a first-aid medical kit equipped with the appropriate supplies can help the child in quick pain relief. Furthermore, good workplace practices require businesses to keep first-aid medical supplies readily available. For, the cost of an injury can prove to be high. It is so important to have a proper first-aid kit that we have created a blog to list down essential information around the kit for ensuring everyday safety. But before we get into the details, it is important to first understand why a medical kit can make a difference between quick respite and a grievous injury. A proper medical kit helps bridge time: Having a first-aid kit provides temporary aid until one can get help. No kit means no immediate help. Precious time to respond can mean further injury, which may prove fatal. A proper medical kit helps prevent small injuries from becoming big:The longer you wait for treatment, the more severe your injury can become. In this context, immediate treatment can reduce risk. A proper medical kit fosters peace-of-mind: Being prepared and even being able to help others when injury occurs is a strong enough case to have a first-aid kit handy. The purpose of any first-aid kit is to treat cuts, scrapes, bruises, burns, etc. In the workplace, especially in a factory environment where employee safety and health is paramount, it is not only meant to help the employee get quick relief, but also to keep them productive on the job. Besides, regulations also enforce such establishments to have a well-stocked medical kit. At home, it is essential to have one for minimising pain and providing immediate relief around common injuries. Though not many have it, it is essential to also have a medical kit in your car for swift response to accidents, etc. An evaluation of past injuries can help you understand what to stock in your medical kit for ensuring greater effectiveness. For cuts and scrapes, it would be a good idea to have a variety of bandages and gauze. Also, it is essential to look at your immediate environment. For instance, if there is welding or any type of heat generation, then additional burn gel should be stocked. Furthermore, it is suggested that one should always keep basic first-aid supplies on hand for any potential injury. Though it is easy to administer pills and other oral medicines, some basic understanding of medical techniques would be vital for addressing slightly complicated issues like, say, CPR, or certain types of injections. Knowing these procedures is true to the ethos of first-aid in terms of dispensing important medical protocols in saving lives or preventing further complications. It is important that you check your medical kit regularly to weed out expired, damaged, soiled, or even partially-used products. Consumption of these might have fatal side-effects. Also, one must engage in safe disposal of these. Furthermore, there some things in your first-aid kit that you might frequently exhaust, like Band-Aids. Replace the missing items so you have them in the future. The entire purpose of a medical kit will be wasted if it is kept in a place that is not easy to reach. Also, if you are not keeping the kit in a pre-decided place, it will be counter-productive to search for it when you should be actually administering the first-aid. So ideally, the kit should be kept in a fixed place and also within easy reach for children to also access it. Often, in the quest to stock the right contents within the kit, the kit itself is ignored. Usually, we make do with a pouch or a bag that does not find utility elsewhere. 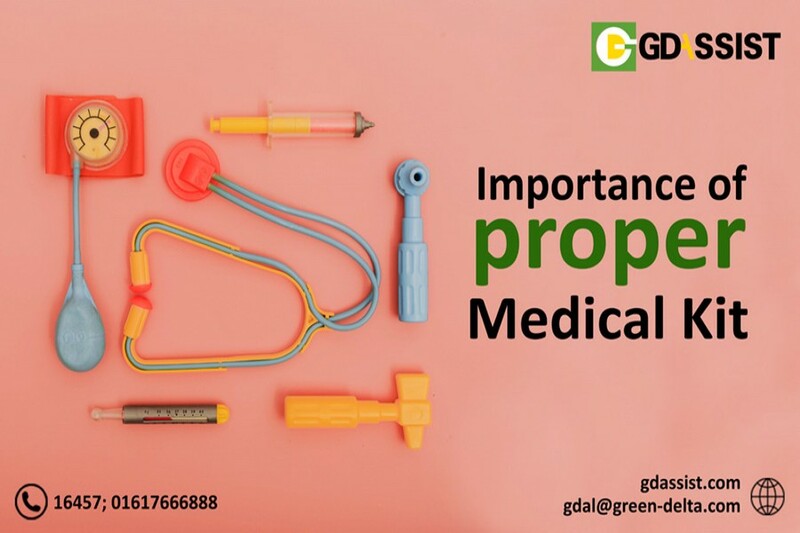 However, it is of paramount importance to procure a professional medical pouch/kit, which has proper inserts/straps/holders for safely storing the different items of first-aid. Besides, such bags are also easily identifiable as they are generally white in colour with a bold red medical cross on it. We urge you to take a closer look at your first-aid kit and restock items that you may have run-out of, while also evaluating the additional resources you might require to upgrade your kit’s quality. And yes, while talking about first-aid and health, health insurance is yet another critical resource that you should have in your ‘life’s medical kit’. So here’s wishing you injury-mitigated homes and offices. Long live the first-aid kit!